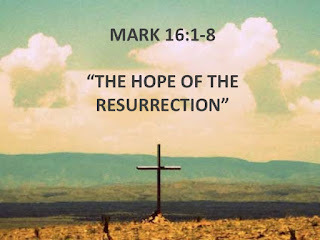 Introduction: The renowned Evangelical theologian Carl F. H. Henry once said of Jesus that “He planted the only durable rumor of hope amid the widespread despair of a hopeless world” (As cited by Ray Stedman, A Rumor of Hope: The Good News of Easter, p, 24). This statement may sound a bit odd to many of us because we so often think of rumors as gossip that is at least mostly untrue. But, of course, not all rumors are untrue. For example, I am reminded of my service in the Navy, when I and my shipmates would hear rumors about where the ship was going next, or about some training exercise coming up, or about some difficult or dangerous situation that awaited us. Yet no matter how often the officers would tell us not to pay any attention to such rumors, it was uncanny how often the rumors were actually true! In the same way, we shall read about where the rumor of Jesus' resurrection began. We shall also see that it is a true rumor and that it is indeed – as Carl Henry put it – “a rumor of hope”! NKJ Mark 16:1 Now when the Sabbath was past, Mary Magdalene, Mary the mother of James, and Salome bought spices, that they might come and anoint Him. NKJ Mark 8:31-32a And He began to teach them that the Son of Man must suffer many things, and be rejected by the elders and chief priests and scribes, and be killed, and after three days rise again. 32 He spoke this word openly. To be sure, most of this teaching was done among the Twelve, but we have every reason to believe that He said the same things to His other followers as well (a fact confirmed by the angel's words in Luke's account – Luke 24:5-7). Sadly, however, we see in the text before us that the women clearly were not expecting to find that Jesus had risen from the dead. They had no hope that they would see Him alive again. But they nevertheless showed remarkable devotion, for they spent money to buy spices – which would not have been cheap – and they came to anoint Jesus' body even though it would have begun to decompose rapidly in the climate of Jerusalem. Their devotion is also seen in their going to the tomb early in the morning, as the next verse indicates. NKJ Mark 16:2 Very early in the morning, on the first day of the week, they came to the tomb when the sun had risen. Mark has already informed us that the women did not come to the tomb sooner because they had to wait for the Sabbath to end before they could buy the appropriate spices. But he is sure to report that they came just as soon as they could. Application: Even though we do not always trust in the Lord's promises as fully as we should, and even though the immediate future may even appear hopeless to us, we can be encouraged that Christ will work in our lives – as we will see that He worked in the lives of these women – if we remain devoted to Him and available. After all, these women may not have trusted in Jesus' promise of resurrection as they should have, but they clearly did remain devoted to him, and they were there! NKJ Mark 16:3 And they said among themselves, "Who will roll away the stone from the door of the tomb for us?" Not only did these women come with the low expectations of a weak faith, but they hadn't even planned out how they were going to get into the tomb to anoint Jesus' body. The stone would have been so large that it would have required a number of strong men to move it. Perhaps in their grief and dismay, they simply weren't thinking clearly. Application: What about those of us here this morning? Are there some here today that are going through difficult times that feel confusing and hopeless? That have a hard time even looking far enough ahead to plan as they should? If there are any here today whose struggles feel so overwhelming to them, then you are among those who need to have a revelation of hope today. You need to be reminded of the hope that we have in Jesus Christ our Lord. Look with me again to see how, as the women in our text approach the tomb, they will see the first indication that a whole new life awaits them! NKJ Mark 16:4 But when they looked up, they saw that the stone had been rolled away -- for it was very large. Apparently, as they were discussing their dilemma about the stone on their way to the tomb, they looked up as they approached and saw that it had already been moved. I wonder what would have been going through their minds as they came up to the open entrance of the tomb? Were they relieved that they didn't have to move the stone? Were they wondering if someone else was already in the tomb? Were they beginning to worry that the body may have been moved? We don't know what they were thinking, but we can imagine that many thoughts were going through their troubled minds … except for one thought … the thought that Jesus had, in fact, risen from the dead! We can only imagine their surprise, then, when they entered the tomb and and encountered a revelation from God that would change their lives forever! NKJ Mark 16:5 And entering the tomb, they saw a young man clothed in a long white robe sitting on the right side; and they were alarmed [ἐκθαμβέω, ekthambéō]. The appearance of this angelic being also helps to explain the alarm of the women upon entering the tomb, although, as we will see, the absence of Jesus' body contributed much to this reaction! The Greek word translated alarmed – ekthambéō – is a very strong word. The Greek-English Lexicon of the New Testament and Other Early Christian Literature gives this definition: “… to be moved to a relatively intense emotional state because of something causing great surprise or perplexity … [to] be amazed … [to] be overwhelmed … [to] be alarmed... [or to] be distressed” (#2359, BibleWorks). 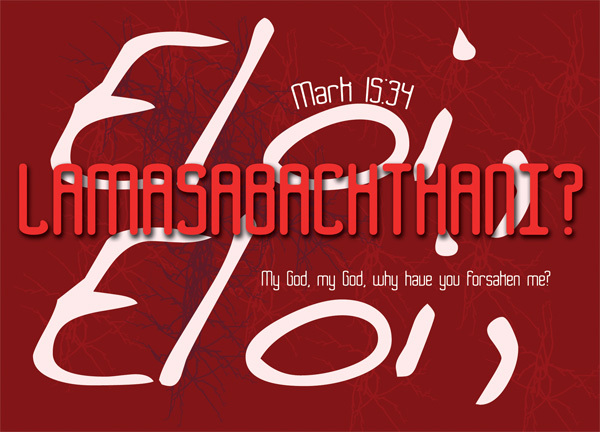 The word ekthambéō is used only by Mark in the New Testament, who appears to reserve its usage for special occasions of great spiritual significance. This reminds me of how a brother once told me that he doesn't like to use the word awesome except with reference to God. To be sure, it is an overused word these days, overused and cheapened almost to the point of being meaningless. One thinks, for example, of the surfer dude describing an “awesome wave.” This is why I suspect that Mark would appreciate that brother's thinking, for he has done a similar thing with this Greek word ekthambéō. As I have already said, he is the only New Testament author to use this particular word, and he appears to reserve its usage only for special occasions of great spiritual significance. In fact, it is found only three other times in the Gospel of Mark. Let's take a few minutes to briefly examine each of these instances. The angel's tender words, “Do not be alarmed,” followed by an explanation of what happened to Jesus' body, seems to presuppose that their alarm was at least in part due to the fact that the body they sought was not there. The angel points out that they were seeking the crucified Jesus, who had been buried a few days before, but that they should be seeking the risen Jesus! Since they had not believed the promise of His resurrection as they should have, the angel thus stresses that the promise had indeed been fulfilled. NKJ Mark 15:40-41 There were also women looking on from afar [watching the crucifixion of Jesus], among whom were Mary Magdalene, Mary the mother of James the Less and of Joses, and Salome, 41 who also followed Him and ministered to Him when He was in Galilee, and many other women who came up with Him to Jerusalem. NKJ Mark 15:47 And Mary Magdalene and Mary the mother of Joses observed where He was laid [τίθημι]. The angel is making sure that these women, who had followed the events of the death and burial of Jesus so closely, have all the facts clearly in their minds, for they are called upon to be the first human witnesses of the resurrection of Jesus, as we see in the next verse. NKJ Mark 16:7 But go, tell His disciples – and Peter – that He is going before you into Galilee; there you will see Him, as He said to you. The women had not expected the resurrection, but they still got to be the first witnesses to it. And now the angel gives these women a divine commission to be the first witnesses to tell others about the resurrection of Christ, something else they surely did not expect! This is yet another reason we see the trustworthiness of the Gospel accounts, for in that culture they surely wouldn't have recorded that women were the first witness if it were not true. Yet the women are commanded to go tell “the disciples – and Peter.” Note that these same men who had abandoned Jesus and fled in fear are still called His disciples. And see how Peter – who failed most of all – is singled out as one who is to see Jesus risen from the dead. Application: Praise the Lord that His ability to use us does not depend on our faithfulness, but on His faithfulness! Nothing, not even our failures or the weakness of our faith, “shall be able to separate us from the love of God which is in Christ Jesus our Lord” (Romans 8:39). Suppose I promise to give you a million dollars Monday at noon, and then a thousand dollars Tuesday at noon. You might have reason to doubt my promise – particularly if you could see my bank balance! But suppose I manage to fulfill the promise on Monday – you get the million dollars! What do you expect to happen on Tuesday? If I fulfilled the promise to give you a million dollars on Monday, surely I’ll give you the thousand dollars on Tuesday! You will have no doubt! I’ve kept the hard promise – surely I’ll keep the easier one. Such were the kinds of lesson these women would learn from this amazing event, but probably not until they had some time to reflect upon it. As we will see in the next verse, they were initially too afraid to do anything but flee from the scene. NKJ Mark 16:8 So they went out quickly and fled from the tomb, for they trembled and were amazed. And they said nothing to anyone, for they were afraid [φοβέω, phobéō]. After Jesus cast a legion of demons out of a man in Gadara: NKJ Mark 5:15 Then they came to Jesus, and saw the one who had been demon-possessed and had the legion, sitting and clothed and in his right mind. And they were afraid [φοβέω, phobéō]. After a woman had been healed from her bleeding: NKJ Mark 5:33 But the woman, fearing [φοβέω, phobéō] and trembling, knowing what had happened to her, came and fell down before Him and told Him the whole truth. After witnessing the transfiguration of Jesus: NKJ Mark 9:2-6 Now after six days Jesus took Peter, James, and John, and led them up on a high mountain apart by themselves; and He was transfigured before them. 3 His clothes became shining, exceedingly white, like snow, such as no launderer on earth can whiten them. 4 And Elijah appeared to them with Moses, and they were talking with Jesus. 5 Then Peter answered and said to Jesus, “Rabbi, it is good for us to be here; and let us make three tabernacles: one for You, one for Moses, and one for Elijah” – 6 because he did not know what to say, for they were greatly afraid [ἔκφοβος, ékphobos, “pert. to being intensely afraid, terrified” (BAGD3 #2452, BibleWorks)]. Now, getting back to the women in chapter 16, we know that after some time they did go and tell the other disciples as the angel had commanded them, since both Matthew (28:8) and Luke (24:8-12) tell us that they did. And Mark himself tells us in verses 9-11 that Mary Magdalene went and told the disciples. But Mark wants us to know that they were initially paralyzed by their fear. Although he doesn't go into detail about the exact reason(s) for their fear, we can conclude from his usage of the same term elsewhere in his Gospel that their fear was at least in part due to the fact that they had experienced a Divine revelation from a messenger of God and were apparently still in shock over the event. But it is also possible that they were afraid for other reasons as well, such as fear that they might not be believed when they told others what the angel had said to them. If this was the case, it wasn't an irrational fear, since Mark tells us that the other disciples did not, in fact, believe them, at least not at first (vs. 11). But notice that, in spite of their fear, Mark doesn't in any way indicate that these women themselves were disbelieving. In fact, one can only conclude that it was their faith that overcame their fear and eventually led them to go and tell the others what they had seen and heard. Conclusion: Application: What can we learn from their example? Well, it seems to me that we can see here how faith can be mixed with fear and still be genuine. Perhaps you are one who has felt fear at hearing what God says in His Word and what He commands you to do. Perhaps you have even been afraid to tell others about your risen Savior, the Lord Jesus Christ. Perhaps you have even begun to doubt your own faith at times. Well, just know this, that being afraid doesn't mean you have no faith, even if it may indicate a weak faith. The real question for you is this: Will you allow your fears to conquer your faith, or will your faith win out in the end? Perhaps what you do when you leave here today with the Gospel message concerning the risen Lord will tell the tale. 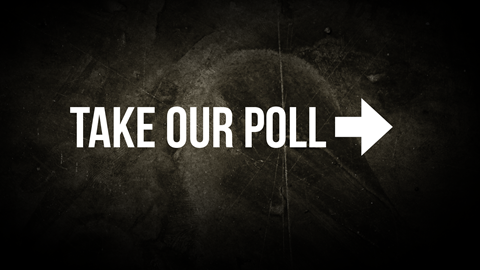 Will you go out in faith to tell others? Will you trust the Lord to be with you and to enable you? If you question whether your faith is strong enough, then perhaps you should learn a lesson from another incident recorded in Mark. When a certain father approached Jesus and asked for help for his demonized son, “Jesus said to him, 'If you can believe, all things are possible to him who believes.' Immediately the father of the child cried out and said with tears, 'Lord, I believe; help my unbelief! '” (9:23-24). You may question whether you have the faith to obey the command you have been given to tell others about Jesus, but do you have enough faith to cry out to Jesus and ask Him to help your weakness? If so, then you have enough faith to overcome your fears as these women did on the morning of Jesus' resurrection. For those of you who may not yet have trusted in the Lord Jesus for salvation, I encourage you to hear the words of Scripture and believe. You can read the rest of the article, together with the references supporting the claims, here. They have also announced in the article that this is only "a temporary statement with references" and that "a full statement will be published in summer 2016." We Christians who hold to sola Scriptura are of course not surprised to hear of these dangers, for we know that "God created man in His own image; in the image of God He created him; male and female He created them" (Gen. 1:27 NKJ). 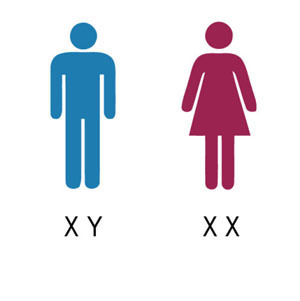 We also know -- despite the well-intentioned point made above -- that people are "born with an awareness of themselves as male or female" but that they "suppress the truth in unrighteousness" (Rom. 1:18 NKJ). We thus know that inherent sin, together with a sinful environment which encourages it, are what leads leads to gender confusion. However, we must pray that more people in our culture begin to think clearly about the real dangers of ignoring the notion that "facts – not ideology – determine reality." Frankly, I am not at all satisfied with this answer, because I think it is problematic for a couple of reasons. First, I think it creates a Christological problem in that it supposes that Jesus could be completely separated from God the Father in His humanity and even suffer spiritual death, while at the same time being united with Him in His deity. But this seems to deny the important point that Jesus was both fully God and fully man in one person. To be sure, there are certain things we must say about Jesus with respect only to His divine nature – such as when we describe Him as omniscient or omnipresent. And there are certain things we must say about Jesus with respect only to His human nature – such as when we describe Him as tired or hungry or tempted by sin. But there are also certain things we must say about Jesus as a person – such as when we describe Him as loving or righteous. This is because, if we said that He was sinful in His humanity, we would also be saying He was a sinful person, since He was only one person – albeit with two natures – and we could thus not avoid impugning His character as God. So I am concerned that we are treading on dangerous ground if we say that He could be separated from God even if only in terms of His humanity, because this would imply separation not only from God the Father but also from Himself as God, since God the Father and God the Son are forever one and are inseparable (e.g. John 1:1-3). I am glad that the staff of the Billy Graham Evangelistic Association correctly assert that “there is an unfathomable mystery” in our understanding of how “Jesus was both God and man united in one divine Person,” but they clearly don't think it is a mystery that He is such a Person. So why adopt an interpretation that seems to clearly undermine this assertion? Second, although they correctly assert that Jesus was citing “the opening line of Psalm 22 and using it to express His deep agony on the cross,” they fail to appreciate fully the significance of this citation. For had they fully appreciated why Jesus cited the opening line of Psalm 22, then they would not have asserted that He was separated from God the Father. At any rate, I hope to show you this morning what I think is a better interpretation of this text. And, in order to better understand this cry of Jesus from the cross, we will examine first the context of the cry, and then the meaning of the cry. We find the immediate context of the cry in verse 33. NKJ Mark 15:33 Now when the sixth hour had come, there was darkness over the whole land until the ninth hour. Mark specifies that there was a darkness over the whole land beginning at “the sixth hour,” which was noon, when the sun was directly overhead and the day was typically at its brightest. He then says that this darkness was over the whole land until “the ninth hour,” which was 3:00 in the afternoon. Clearly, then, he wants us to see that this was a miraculous event and thus a sign from God. Clearly a miraculous darkness in the middle of the day would be a sign of God's judgment, wouldn't it? In this case it would signify the judgment of the Day of the LORD. NKJ Exodus 10:21-23 Then the LORD said to Moses, “Stretch out your hand toward heaven, that there may be darkness over the land of Egypt, darkness which may even be felt.” 22 So Moses stretched out his hand toward heaven, and there was thick darkness in all the land of Egypt three days. 23 They did not see one another; nor did anyone rise from his place for three days. But all the children of Israel had light in their dwellings. This plague was then followed by the tenth plague, when all the firstborn in the land of Egypt were killed, but God instituted the first Passover in order to protect His people who trusted in Him for their salvation. Even so, when Jesus “our Passover” – as Paul later calls Him (1 Cor. 5:7) – was killed at the time of the Passover celebration in Jerusalem, the miraculous darkness during the brightest part of the day seems to indicate the wrath of God upon the people who were killing Jesus and upon Jesus Himself as He bore the wrath of God for His people. So we see that darkness over the land is a sign of God's judgment. But, as we also know, instead of God's wrath being poured out on those who deserved it, it was poured out on our Lord and Savior Jesus Christ, who “Himself is the propitiation for our sins” (1 John 2:2; 4:10). And this leads us to our next point. We will examine the meaning of the cry as we consider verse 34. There are at least a couple of things we can say about the meaning of this cry. First, it is a cry of anguish. NKJ Isaiah 51:17 Awake, awake! Stand up, O Jerusalem, You who have drunk at the hand of the LORD the cup of His fury; you have drunk the dregs of the cup of trembling, and drained it out. This is the kind of thing Jesus meant to say when He referred to the cup He was about to have poured out upon Him on the cross. And thus, when He cried out with a loud voice and said “My God, My God, why have You forsaken Me?” He was describing the experience of the wrath of God being poured out upon Him, the one about whom the Father had previously said, “You are My beloved Son, in whom I am well pleased” (1:11). NKJ Isaiah 53:10-12 Yet it pleased the LORD to bruise Him; He has put Him to grief. When You make His soul an offering for sin, He shall see His seed, He shall prolong His days, and the pleasure of the LORD shall prosper in His hand. 11 He shall see the labor of His soul, and be satisfied. By His knowledge My righteous Servant shall justify many, for He shall bear their iniquities. 12 Therefore I will divide Him a portion with the great, and He shall divide the spoil with the strong, because He poured out His soul unto death, and He was numbered with the transgressors, and He bore the sin of many, and made intercession for the transgressors. NKJ Romans 3:21-26 But now the righteousness of God apart from the law is revealed, being witnessed by the Law and the Prophets, 22 even the righteousness of God, through faith in Jesus Christ, to all and on all who believe. For there is no difference; 23 for all have sinned and fall short of the glory of God, 24 being justified freely by His grace through the redemption that is in Christ Jesus, 25 whom God set forth as a propitiation [a sacrifice that assuages the wrath of God] by His blood, through faith, to demonstrate His righteousness, because in His forbearance God had passed over the sins that were previously committed, 26 to demonstrate at the present time His righteousness, that He might be just and the justifier of the one who has faith in Jesus. NKJ 1 Thessalonians 5:9-10 For God did not appoint us to wrath, but to obtain salvation through our Lord Jesus Christ, 10 who died for us, that whether we wake or sleep, we should live together with Him. So, Jesus cried out in anguish as He bore the Father's wrath for our sins, and this too was pleasing to the Father, who was not separated from Him but looked upon Him and was satisfied with His offering. For Jesus willingly did this as a part of His Father's gracious plan to save us, which leads us to our next point. Second, it is a cry of faith. NKJ Psalm 22:14-21 I am poured out like water, and all My bones are out of joint; My heart is like wax; it has melted within Me. 15 My strength is dried up like a potsherd, and My tongue clings to My jaws; You have brought Me to the dust of death. 16 For dogs have surrounded Me; the congregation of the wicked has enclosed Me. They pierced My hands and My feet; 17 I can count all My bones. They look and stare at Me. 18 They divide My garments among them, and for My clothing they cast lots. 19 But You, O LORD, do not be far from Me; O My Strength, hasten to help Me! 20 Deliver Me from the sword, My precious life from the power of the dog. 21 Save Me from the lion's mouth and from the horns of the wild oxen! You have answered Me. NKJ Luke 23:44-46 Now it was about the sixth hour, and there was darkness over all the earth until the ninth hour. 45 Then the sun was darkened, and the veil of the temple was torn in two. 46 And when Jesus had cried out with a loud voice, He said, “Father, 'into Your hands I commit My spirit. '” Having said this, He breathed His last. NKJ Psalm 22:22-24 I will declare Your name to My brethren; in the midst of the assembly I will praise You. 23 You who fear the LORD, praise Him! All you descendants of Jacob, glorify Him, and fear Him, all you offspring of Israel! 24 For He has not despised nor abhorred the affliction of the afflicted; nor has He hidden His face from Him; but when He cried to Him, He heard. You see, Jesus knew that, even while He was experiencing an agony beyond description on the cross, His Father would be glorified through it, for He had not hidden His face from Him but was satisfied with what He did and was pleased with Him as He did it, just as Isaiah prophesied that He would be. Conclusion: I hope, then, that you can see that Jesus was not separated from the Father as He died in our place on the cross. Instead He was working together with the Father, fulfilling the Father's plan, to bear our sins and provide salvation for us fully and freely. This is why those of us who have trusted in Christ as Lord and Savior need not fear God's wrath, for Jesus is our Shepherd and Guardian. As the apostle Peter said, “[He] Himself bore our sins in His own body on the tree, that we, having died to sins, might live for righteousness – by whose stripes you were healed. For you were like sheep going astray, but have now returned to the Shepherd and Overseer of your souls” (1 Pet. 2:24-25). 12% say that one must adhere at a minimum to a Calvinistic soteriology in order to be regarded a Reformed Baptist. 39% say that one must adhere substantially to the Baptist Confession of 1689 (e.g. 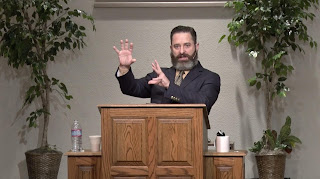 modify regarding Impassibility) in order to be regarded a Reformed Baptist. Listen to Jeff's interview on the Refining and Reforming Podcast as he discusses The Absurdity of Unbelief: A Worldview Apologetic of the Christian Faith, his excellent new book on apologetics. I highly recommend the book as an outstanding example of presuppositional apologetics. Jeff ably demonstrates how all other worldviews but the Christian worldview are internally inconsistent and ultimately end in absurdity. In his interview on the R&R podcast, Jeff offers a good overview of what you can expect in more detail in the book. You may listen to the interview here. You may purchase the book here or here. Today I want to recommend Leonard's Book Restoration Station to the blog's readers. Back in February of 2014 I had my favorite Bible rebound by them, and I have been thrilled with it ever since. 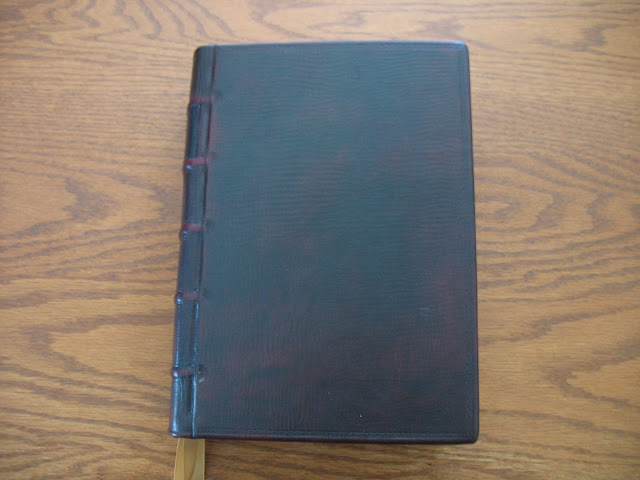 It is a hardcover New Geneva Study Bible in the New King James Version, which has been my daily Bible, as well as my preaching Bible, for at least the past twenty years. But it was beginning to fall apart, so I chose to have it rebound in one of Leonard's historical series of bindings -- the 16th Century Geneva Style -- and it looks like it came right out of the 16th century! 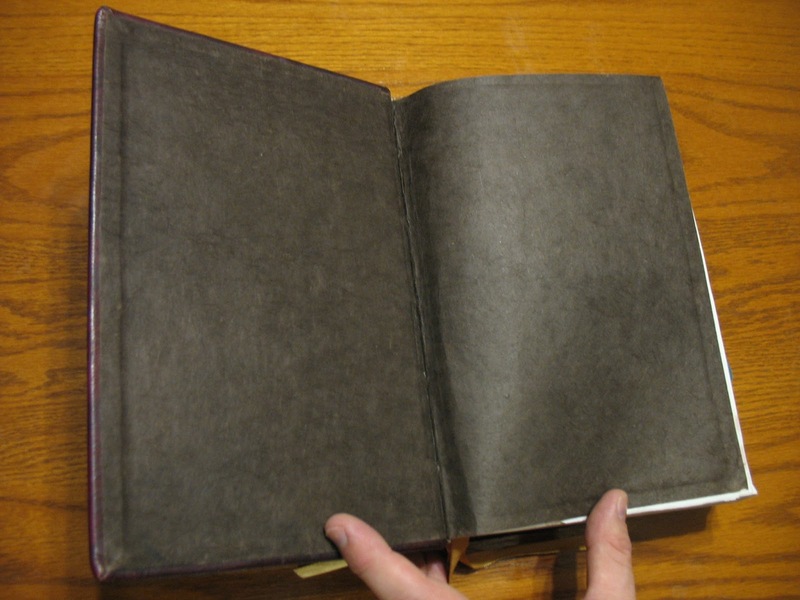 It is hardcover with the highest quality goatskin as seen below. I wish I had some before pictures, especially of the inside of the Bible where it had pages coming out and some severely wrinkled pages as well, all of which were admirably fixed by the kind folks at Leonard's. 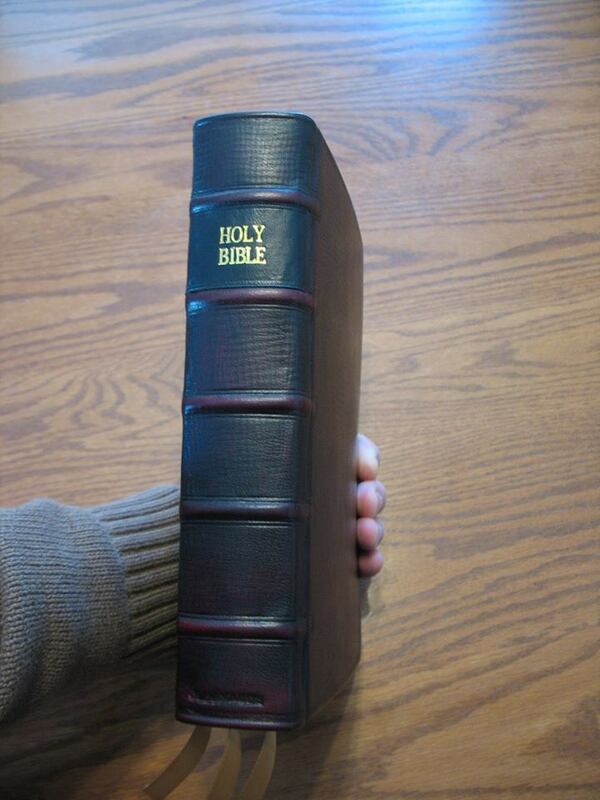 The "Holy Bible" label (seen below) is an applied black leather with nice gold embossed letters that really pop. You can see where "Leonard's" has been unobtrusively embossed on the bottom of the spine. 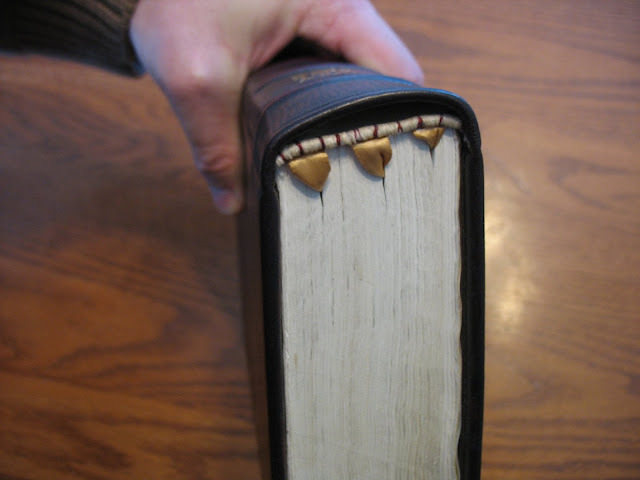 The hand-tooled spine ridges are also very nice. 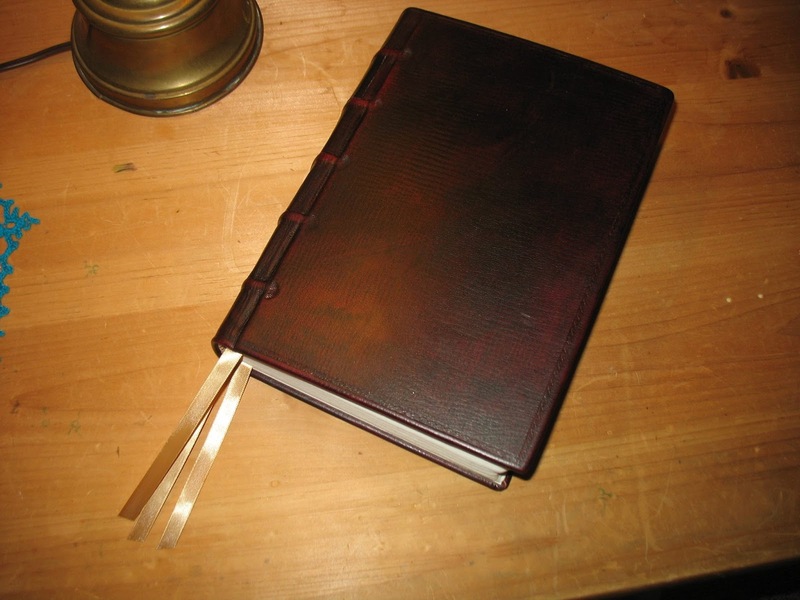 The Bible has a smyth-sewn binding that is hand-sewn, with quality silk stitching on the hand-sewn head and tail bands as well (see below). Notice also the great spacing of the three ribbons. 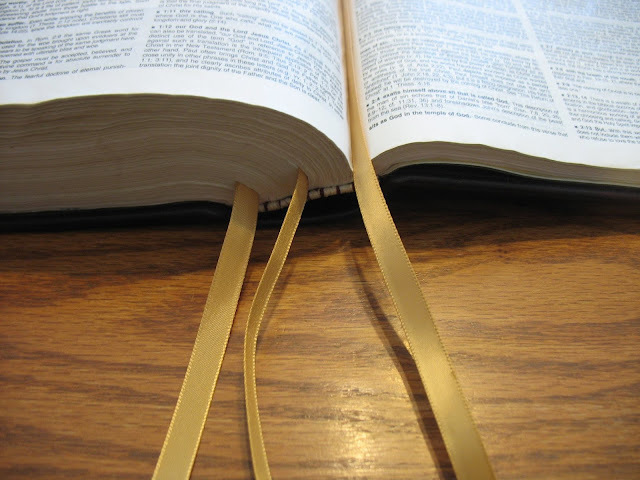 Some Bible binders put their ribbons in really awkward places, or cram them all into the middle, making them very difficult to use in my opinion, but I love the way Leonard's spaced them. If you're like me, and you like to make lots of exegetical notes in your Bible as you study (see below, and notice again how the Bible naturally lays flat), then you too may rather rebind it than part with it for a new Bible. If so, you may want to give Leonard's Book Restoration Station a try. They have many styles to choose from, but you can also personalize it almost any way you like. I highly recommend Leonard's for anyone who wants to have a Bible rebound to last a lifetime. 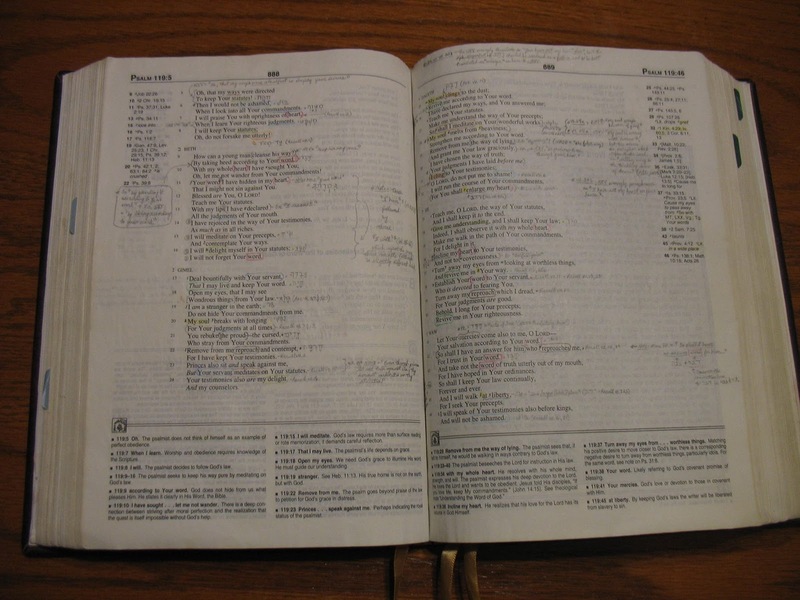 You may even want to purchase a new inexpensive Bible and then have it rebound the way you want it. The process was easy, and the folks at Leonard's were very polite and helpful. I would use their services again any time. They can do hardcover or softcover, and they have quality calfskin, goatskin, or kangaroo hide. 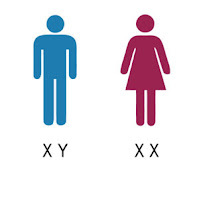 Check out some of their many options here. If you want to find a good place to read reviews of high quality Bibles, I recommend checking out the Bible Design Blog. 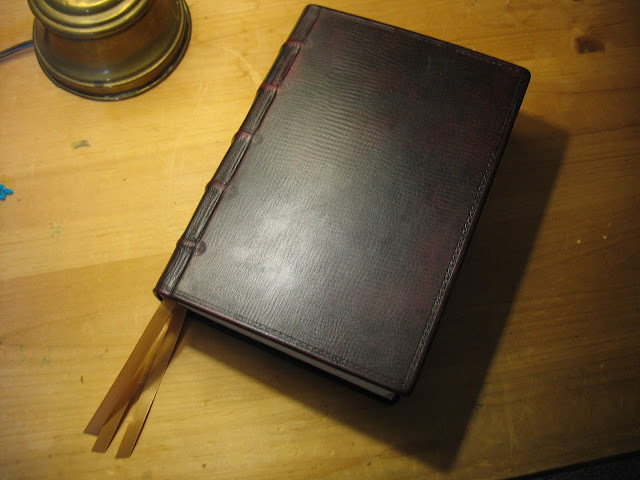 It also has a review of Leonard's 16th Century Geneva Style binding here.